Nine years ago, Sophie and I nonchalantly asked Hayden (Kho) how can we get rid of our eye bags. I was giggling when I was looking at the photos that accompanied the original post because the three of us looked so young then! I will never forget Hayden's honest to goodness answer: removing our eye bags then (I was in my mid-twenties) will cause more harm than good. He further quipped that if it's the puffiness that we're concerned of, if we had it removed then, we'll ask him to fill it back when we reach our 50s. I asked how about the dark circles? He said: only a good concealer will help you unless you will commit that you'll get enough rest every single day. So this post is really dedicated to everyone who share the same predicament I have. I've searched high and low and found 4 magic wands that work great in hiding my eye bags, cheating everyone that I've been a good girl getting 8 hours of sleep 7 days a week. First on your left is the Happy Skin Bye Bye, Blues Brightening Concealer Wand in Medium Beige (Php 899). If your eye area needs color correcting, you can try this since it has components that brightens and highlights the under eye area in a single swipe. It's smooth in texture, weightless, and pigmented yet never settles on fine lines. If you need a super long wearing, waterproof, and transfer-proof concealer, you have to checkout the MAC Pro Longwear Concealer ($23). I use the shade NW25 and IMO, this is best layered on with a natural haired brush such as the MAC 214 brush. In my case, I never need more than half a pump every time to cover my undereyes plus pimples if there are any. If there's a con I can think of, it would only be that the glass bottle's so thin! 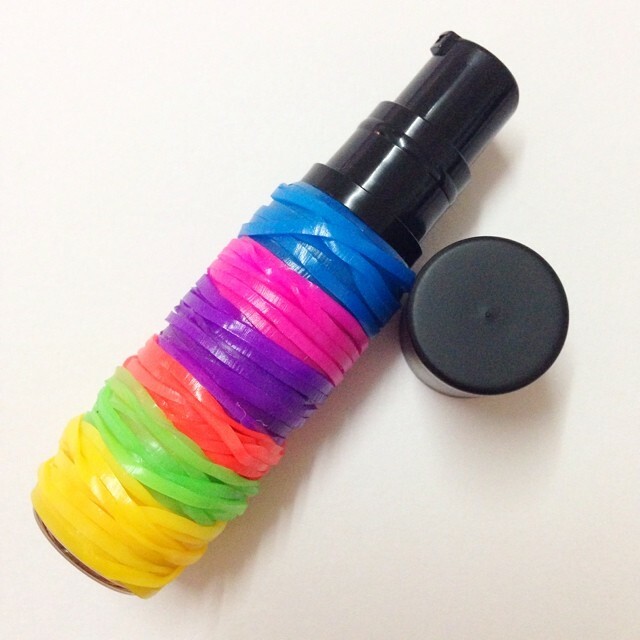 To protect the product (and your heart) from shattering upon dropping, I followed Karen's advise: wrap the entire bottle with rubber band. The last two are Maybelline New York's superstars in the concealer arena: Age Rewind Eraser Dark Circles Concealer + Treatment (Php 399) and Fit Me Concealer (Php 199). All around awesome concealer but might be thick or may set on deep creases. Best for under eye circles in terms of coverage and treatment component.